ZDNet: Microsoft is planning to improve the experience of its MSN-branded online music store with a new subscription service expected later this year that will include a downloadable software application separate from the standard Windows Media Player. Yahoo's recent market entrance has undoubtedly shortened their time table, but it's about time they get their feet wet and get off the sidelines... "The tentative features of the new service (which is still under development) include advanced community aspects and playlist-sharing. But sources say Microsoft is also considering a more direct attack on Apple, seeking rights from copyright holders to give subscribers a new, Microsoft-formatted version of any song they've purchased from the iTunes store so those songs can be played on devices other than an iPod." Yahoo: Today, MSN launched a new Spanish-language version of its popular MSN Video service and also announced that it is hosting the official Web site for the 2005 Billboard Latin Music Conference & Awards - which started today in Miami. "As presenter of the most celebrated awards show in the Latin music industry, we wanted that same high level of prestige and dedication from our online content partner for this year's event," said John Kilcullen, president and publisher of Billboard..."and we're thoroughly impressed with MSN's creativity and commitment in delivering extensive, quality entertainment content to Hispanic audiences on the Web." purchased songs loaded onto the unit. 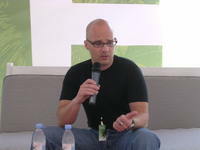 With respect to the future, Conte said that Microsoft will broaden its catalogue with more depth as quickly as possible. He stated that part of the problem of managing this content growth up to this point has been that they had picked only 1 vendor to do their encoding and that created a backlog. In addition to hiring Sony last month to help with some of the overflow, the company has also hired a 3rd vendor to speed up the process – which I’m sure a lot of labels and artists that signed with them months ago (but have yet to be posted on the site) will be glad to hear…. Mariah Carey has partnered with MSN to exclusively deliver digital downloads of her new single "We Belong Together." Apparently, this deal is the latest premiere of Universal Music Group's (UMG) Content being made available on MSN Music. The new album, "The Emancipation of Mimi" is set to arrive in stores April 12, but fans can get it now through MSN Music. In addition, the portal will also host the world premiere of the accompanying video. According to Steve Bartels, CEO of Island Records, "This is a terrific new opportunity for Island Def Jam and MSN Music to collaborate on a campaign that centers on one of the most important artists in all of pop music history." MSN also recently had the exclusive scoop on UMG artists: Beck, Eminem, and JoJo. And finally, despite Apple's recent claims to have been the first and only store to offer 1 million songs, the press release states that MSN music also offers "over 1 million tracks available for download in all genres." "Did you read The Long Tail in 'Wired' and feel the hairs on the back of your neck stand up? Do you have the web mentality where every byte counts and ship cycles are measured in weeks, not years? If you passionately say 'yes' to these questions then we want to hear from you. MSN Entertainment is an aggressive, hungry group." 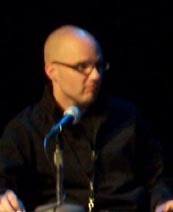 Mike Conte, the Moby lookalike, was interviewed at the Digital Music Forum by Paul Brindley, MD at MusicAlly. Another tame one, where Conte gave the official MSFT spiel about Playsforsure campaign, Janus DRM, and the need for community (MSN Spaces) development in music (at least he used the word blogs, the only one at the conference to use it besides our blog launch announcement). Michael Gartenberg at Jupiter Research writes up this great note to Microsoft, following Apple's dominance in the digital music market, and MSFT's small role in the market till now. And he asks them to find a new leader to head the division: "Let's face it, you have all the tools to respond but at the moment, you seem to lack the leadership to tie it all together...you need a digital music czar." "What you don't have is a coordinated person to make all this stuff work together. To make sure that internal technology is aligned with device vendors and music stores and services. That there's a single, coordinated marketing message that can be presented to consumers, press and analysts and that you not only respond and react to competitors rules but you actually start changing the rules of the game." Apple iPod Phone To Be Released Sep 7? With Cingular? Ralph Lauren Polo Outlet on Are Album Liner Notes and Artwork Becoming Extinct? Ralph Lauren Outlet Online on Are Album Liner Notes and Artwork Becoming Extinct? Ralph Lauren Outlet on Are Album Liner Notes and Artwork Becoming Extinct? Prada Outlet on Are Album Liner Notes and Artwork Becoming Extinct? Billboard PostPlay is Billboard's news blog covering the business of digital music, both online and mobile.